Purpose: Odontoid fracture is a very common cervical injury, especially in elderly patients. Despite the high frequency, the appropriate management is still debated. The aim of this study is to evaluate clinical and radiological outcomes after anterior screw fixation or halo vest (HV) in type II odontoid fracture in elderly patients. Materials and Methods: Between January 2013 and December 2015, 135 consecutive patients affected by odontoid process were found. According to inclusion and exclusion criteria, 57 patients were included in the study. Patients were evaluated with visual analog scale (VAS), Smiley–Webster Scale (SWS), Italian Version of the Neck Disability Index (NDI), and patient satisfaction during follow-up. Furthermore, radiological data were evaluated for bone healing. Student's t-test or Fisher's exact test was used between groups, analyzing radiological and clinical results, and level of statistical significance was set at P < 0.05. Results: Seventeen patients were female and 40 were male. Twenty-seven patients were included in surgical group (SG) while 30 were included in HV group with a mean follow-up of 37.74 ± 10.52 months. A significant difference (P < 0.05) between groups was found for pseudoarthrosis, with a lower rate for SG. No significant differences in term of VAS, NDI, and SWS were found between groups (P > 0.05); SG reached higher satisfaction than HV group (P = 0.0271). Conclusions: Both treatments are equivalent in terms of clinical outcomes, and they are a valuable choice in the management of type II odontoid fracture. However, it must be considered that patients could slightly tolerate HV and may need a change of treatment. Odontoid fracture is a very common cervical injury, accounting approximately for 9%–15% of all cervical fractures and 50% of spine fractures in the elderly. The high prevalence of osteoporosis in elderly people makes the odontoid fracture, the most common cervical fracture in over 70-year-old patients.,,, These injuries, usually, result from an hyperextension or hyperflexion mechanism of the cervical spine in low-energy impacts such as falls for elderly patients or in high-energy impacts such as motor vehicles accidents for young people., In high-energy trauma, this kind of fracture is related very often to spinal cord injury and visceral trauma, with an high incidence of mortality. Due to this reason, it is not easy estimate the exact prevalence of this fracture while the majority of surviving patients do not have spinal cord impairments. The correct treatment must be chosen considering the patient global health status, the type of fracture, classified by Anderson and D'Alonzo and its dislocation grade to comprehend the healing possibility. Treatment options include cervical orthosis, halo vest (HV), or surgical intervention (C1-C2 fusion, anterior screw, or posterior approach). Conservative treatment has the advantage to avoid anesthesia and surgical risks but its associated to an elevated risk of nonunion, especially in type II fractures. The surgical strategy leads to union in >90% of patients. Despite global risks, the surgical approach seems to be preferred in elderly patients with a weak recommendation. The aim of the study is to evaluate and compare clinical and radiological outcomes after surgery (anterior screw fixation) or HV treatment in type II dens fractures in elderly patients. We collected and reviewed clinical and radiological data of patients treated by our institution with HV or anterior screw fixation for type II odontoid fracture. We evaluated bone consolidation through radiological examination at 12 months and visual analog scale (VAS), Neck Disability Index (NDI), Smiley–Webster Scale (SWS), and patients' satisfaction at last clinical examination. Between January 2013 and December 2015, 135 consecutive patients affected by odontoid process were admitted in our Level II Trauma Center. We identified their records, thanks to a retroactive revision of our database using TrakCare program (InterSystem Corporation, Cambridge, MA). We included patients aged over 65 years affected by type II odontoid fractures treated by our institution with HV immobilization [Figure 1] (HV group) or anterior screw fixation (surgical group [SG]) with a minimum follow-up of 24 months. We excluded from our analysis patients suffered by polytrauma and patients affected by inflammatory diseases such as ankylosing spondylitis and rheumatoid arthritis; furthermore, patients with congenital anomaly of cervical spine were not included in the study. We excluded from our analysis also patients with incomplete radiologic or clinical data. 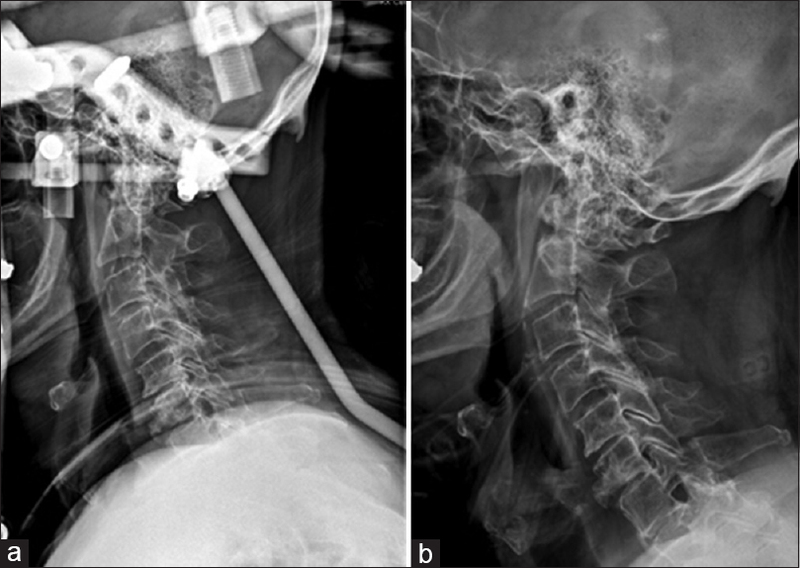 Surgical treatment consisted in anterior screw fixation with standard technique, and after surgery, all patients wore cervical orthosis for approximately 40 days. Patients who underwent HV treatment wore a HV for 60 days and then a cervical collar for at least another month. HV immobilization was positioned under narcosis and local anesthesia for pin insertion, while anterior screw was positioned under general anesthesia. An independent radiologist, not involved in the study, evaluated all radiological data. 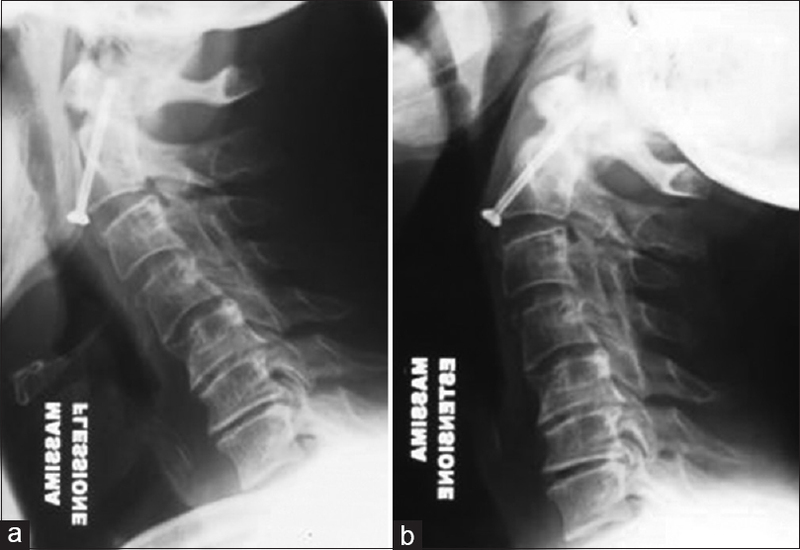 Radiological evaluation was performed for all patients: cervical anteroposterior and lateral X-rays at 40 days, 6–12 months, dynamics X-rays in complete flexion and extension of the cervical spine at 6 months [Figure 2], and computed tomography (CT) at 3 months to assess fracture consolidation. At 12 months of follow-up, all patients were assessed for pseudoarthrosis; if the plain X-ray exhibit any doubts, a CT scan was performed. Fracture was classified according to Grauer revision of Anderson D'Alonzo classification for type II odontoid fracture. During follow-up, patients were clinically evaluated with VAS, SWS, and Italian version of NDI. Excellent and good results at SWS score were considered satisfactory while fair and poor score was considered unsatisfactory. Furthermore, a questionnaire of clinical satisfaction was submitted to all patients. The study was conducted according to the Declaration of Helsinki and its later amendments. The informed consent was obtained from all participants included in the study. Collected data are expressed as mean ± standard deviation. Student's t-test was performed to show differences in clinical scores between populations. Fisher's exact test was used to assess differences in radiological, SWS, and patients' satisfaction. The level of statistical significance was set at P < 0.05. Statistical analysis was performed using STATA 13 Software (Stata Corp. LLC, USA). From original database, 135 patients with odontoid fracture were retrieved and 92 patients were aged over 65 years and affected by type II fractures. Thirty-five patients (38%) decreased in the days after injury or during follow-up without reach 24 months and were excluded from the study. Fifty-seven patients (62%) completed the follow-up and were included in the study. Seventeen (29.8%) were female and 40 (70.2%) were male aged between 65 and 88 years (mean age: 77 ± 6.23 years). Fractures type were classified, thanks to radiological data review, as type II A in 21 patients, type II B in 21, and type II C in 15. Displacement ranged from 2 mm to 5 mm; 0–2 mm for type II A fracture and 2–5 mm in type II B and II C fractures. Twenty-seven (47.35%) patients were included in SG while 30 (52.65%) were included in HV group. Mean follow-up was 37.74 ± 10.52 months (range: 24–68 months). 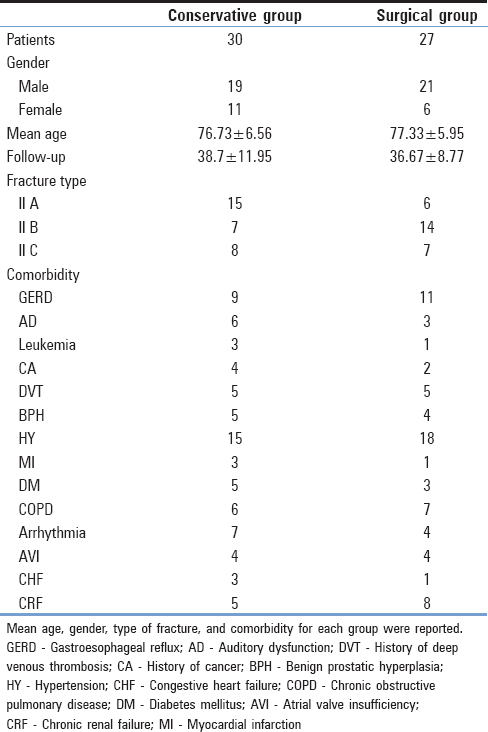 Demographic characteristics are reported in [Table 1]. At the end of follow-up, nine (30%) patients reached complete bone healing and osseous consolidation. Twenty-one (70%) patients did not reach bone consolidation and developed pseudoarthrosis, stable at dynamic X-ray. Three patients reported pin tract pain and two reported pin tract inflammation with no macroscopic appearance of infection, four patients reported thoracic dermatitis under dorsal vest, and one patient reported skin decubitus under dorsal shell solved with advanced medications. Three of those patients required HV replacement with rigid cervical collar after 10 days of treatment due to HV intolerance. No deep vein thrombosis or pulmonary embolism was recorded. At the end of follow-up, patients reported a mean VAS score of 0.73 ± 1.2 (range: 0–3), with a complete pain resolution in 21 (70%) patients. Mean NDI at the final follow-up was 15.33 ± 2.52 (range: 11–19), SWS was excellent in 15 (50%) patients, good in 11 (37%), and insufficient in 4 (13%). Good clinical satisfaction was reached in 83.3% of cases (25/30 patients). Only 22 patients were satisfy about the treatment, while 8 of them did not consider to underwent the same procedure again. At the end of follow-up, 23 (85.2%) out of 27 patients reached complete fracture consolidation. One was affected by type II A odontoid fracture and was surgically treated after a not satisfactory reduction with HV. Four (14.8%) did not reach bone consolidation and developed pseudoarthrosis; three (75%) patients derived by screw's breakage and one (25%) by screw's loosening. Three patients reported transitory dysphagia, which was solved through rehabilitation, while one patient had persistent dysphagia until the last follow-up. One patient reported dysphonia due to recurrent laryngeal nerve injury. No infection or deep vein thrombosis was observed. At the end of follow-up, patients reported a mean VAS score of 0.3 ± 0.87 (range: 0–3) and 24 (89.9%) patients reported a complete pain resolution. Mean NDI at 24 months was 14.15 ± 2.33 (range: 8–18), SWS was excellent in 17 (63%) patients, good in 8 (29.6%), fair in 1 (3.7%), and insufficient in 1 (3.7%). Good clinical satisfaction was reached in 96, 3% (26/27 patients). Only one patient was unsatisfied about the treatment. Student's t-tests performed between SG and HV showed a significant difference (P < 0.05) for pseudoarthrosis, with a lower rate in SG group (SG: 14.8%; CG: 70%). No differences were found between treatment groups for VAS (P = 0.0624), NDI (P = 0.0719), and SWS (P = 0.673). Patients showed a significant higher satisfaction for SG (P = 0.0271). Our study suggested that surgical approach with anterior screw fixation offers higher rate of fracture consolidation; however, both treatments offer similar clinical results. Despite these results, patients showed a significantly higher satisfaction for anterior screw fixation despite some patients suffered from some neurological complications. Osteoporosis is one of the major burdens affecting aged population and the presence of several comorbidities in those patients increase the risk of fall and spine fragility fractures. Comorbidities also increased the risk of death, especially in frail patients. Moreover, odontoid process has a poor vascular supply, responsible of a high rate of nonunion with subsequent pain, instability, and further neurological complaints. Surgical and HV treated have been proposed both in the literature. Anterior screw fixation may be challenging for the high risk of complications, anatomical variation of fracture shape, and poor bone stock. Bracers and HV are both equally used in this kind of fractures; however, some authors do not recommend HV in elderly patients., In those patients, Chen et al. reported an increased amount of 30-day complications and 30-day mortality, while Butler et al. found poorer functional results than patients treated operatively. Despite the fact that surgical treatment achieves a higher rate of fusion than conservative treatment, differences in patient selection may be ultimately responsible for any difference. With these premises, several factors should be considered to reach the best outcome possible, such as age of patient, comorbidity, type of fracture, displacement, associated injury, possibility of fracture fusion, and patients' compliance to treatment strategy. However, since type II odontoid fractures are potentially unstable with subsequent myelopathy and spinal injury risk, early spinal stabilization must always be sought. According to Huybregts, the results of our study showed a lower incidence of nonunion and pseudoarthrosis in the SG. However, clinical outcomes of our study did not differ significantly between operative and HV group, unlike Joestl et al. who found better clinical results in aged patients surgically treated. Despite potential fracture severity, clinical outcomes of odontoid fracture for both treatments showed good results; however, neurological deterioration is a possible but rare complication in elderly patients. The presence of nonmobile pseudoarthrosis is generally considered an acceptable radiological outcome with an intrinsic stability. In fact, Hong et al. found no difference in the rate of development of neurological symptoms between patients with nonmobile pseudoarthrosis and bony union. A recent review of the literature showed that surgery provides an efficacious option for geriatric patients, with an improvement of short- and long-term mortality and suggested, when possible, to surgically treat any unstable vertebral fracture. The retrospective review of radiological data allows us to classify type II fracture shape according to Grauer classification; despite the majority of patients from each subgroup underwent the same treatment proposed by the author, some of them were treated in a different way. This could be responsible of the different union rate in radiological data between groups, but even with this concern, our results were comparable with those of literature. Moreover, the low number of patients involved did not allow us to make a comparison among each subtype of fracture for both treatments. Several limitations to this study must be acknowledged, some of them intrinsic in the study design: the retrospective nature of the study makes necessary to exclude some patients for lack of data, the low number of included patient, the lack of randomization, and grading of osteoporosis severity. Moreover, the different follow-up among patients and the lack of information in electronic database about mortality rate among each annual follow-up may influence the outcomes. Despite lower rate of nonunion or pseudoarthrosis for surgical stabilization, both treatments are equivalent in terms of clinical outcomes. Both are a valuable choice in the management of type 2 odontoid fracture. However, it must be considered that patients could slightly tolerate HV and may need a change of treatment. Maak TG, Grauer JN. The contemporary treatment of odontoid injuries. Spine (Phila Pa 1976) 2006;31:S53-60. Tashjian RZ, Majercik S, Biffl WL, Palumbo MA, Cioffi WG. Halo-vest immobilization increases early morbidity and mortality in elderly odontoid fractures. J Trauma 2006;60:199-203. Hernlund E, Svedbom A, Ivergård M, Compston J, Cooper C, Stenmark J, et al. Osteoporosis in the European Union: Medical management, epidemiology and economic burden. A report prepared in collaboration with the international osteoporosis foundation (IOF) and the European federation of pharmaceutical industry associations (EFPIA). Arch Osteoporos 2013;8:136. Sarode DP, Demetriades AK. Surgical versus nonsurgical management for type II odontoid fractures in the elderly population: A systematic review. Spine J 2018;18:1921-33. Andersson S, Rodrigues M, Olerud C. Odontoid fractures: High complication rate associated with anterior screw fixation in the elderly. Eur Spine J 2000;9:56-9. Müller EJ, Wick M, Russe O, Muhr G. Management of odontoid fractures in the elderly. Eur Spine J 1999;8:360-5. Denaro V, Papalia R, Di Martino A, Denaro L, Maffulli N. The best surgical treatment for type II fractures of the dens is still controversial. Clin Orthop Relat Res 2011;469:742-50. Anderson LD, D'Alonzo RT. Fractures of the odontoid process of the axis. J Bone Joint Surg Am 1974;56:1663-74. Harrop JS, Hart R, Anderson PA. Optimal treatment for odontoid fractures in the elderly. Spine (Phila Pa 1976) 2010;35:S219-27. Eap C, Barresi L, Ohl X, Saddiki R, Mensa C, Madi K, et al. Odontoid fractures anterior screw fixation: A continuous series of 36 cases. Orthop Traumatol Surg Res 2010;96:748-52. Raizman NM, O'Brien JR, Poehling-Monaghan KL, Yu WD. Pseudarthrosis of the spine. J Am Acad Orthop Surg 2009;17:494-503. Grauer JN, Shafi B, Hilibrand AS, Harrop JS, Kwon BK, Beiner JM, et al. Proposal of a modified, treatment-oriented classification of odontoid fractures. Spine J 2005;5:123-9. Seybold EA, Bayley JC. Functional outcome of surgically and conservatively managed dens fractures. Spine (Phila Pa 1976) 1998;23:1837-45. Monticone M, Ferrante S, Vernon H, Rocca B, Dal Farra F, Foti C, et al. Development of the Italian version of the neck disability index: Cross-cultural adaptation, factor analysis, reliability, validity, and sensitivity to change. Spine (Phila Pa 1976) 2012;37:E1038-44. Robinson AL, Olerud C, Robinson Y. Epidemiology of C2 fractures in the 21st century: A national registry cohort study of 6,370 patients from 1997 to 2014. Adv Orthop 2017;2017:6516893. Kepler CK, Vaccaro AR, Dibra F, Anderson DG, Rihn JA, Hilibrand AS, et al. Neurologic injury because of trauma after type II odontoid nonunion. Spine J 2014;14:903-8. Chaudhary A, Drew B, Orr RD, Farrokhyar F. Management of type II odontoid fractures in the geriatric population: Outcome of treatment in a rigid cervical orthosis. J Spinal Disord Tech 2010;23:317-20. Chen YR, Boakye M, Arrigo RT, Kalanithi PS, Cheng I, Alamin T, et al. Morbidity and mortality of C2 fractures in the elderly: Surgery and conservative treatment. Neurosurgery 2012;70:1055-9. Butler JS, Dolan RT, Burbridge M, Hurson CJ, O'Byrne JM, McCormack D, et al. The long-term functional outcome of type II odontoid fractures managed non-operatively. Eur Spine J 2010;19:1635-42. Huybregts JG, Jacobs WC, Vleggeert-Lankamp CL. The optimal treatment of type II and III odontoid fractures in the elderly: A systematic review. Eur Spine J 2013;22:1-3. Yuan S, Wei B, Tian Y, Yan J, Xu W, Wang L, et al. The comparison of clinical outcome of fresh type II odontoid fracture treatment between anterior cannulated screws fixation and posterior instrumentation of C1-2 without fusion: A retrospective cohort study. J Orthop Surg Res 2018;13:3. Joestl J, Lang N, Bukaty A, Platzer P. A comparison of anterior screw fixation and halo immobilisation of type II odontoid fractures in elderly patients at increased risk from anaesthesia. Bone Joint J 2016;98-B: 1222-6. Hong J, Zaman R, Coy S, Pastel D, Simmons N, Ball P, et al. Acohort study of the natural history of odontoid pseudoarthrosis managed nonoperatively in elderly patients. World Neurosurg 2018;114:e1007-15. Patel AA, Lindsey R, Bessey JT, Chapman J, Rampersaud R; Spine Trauma Study Group, et al. Surgical treatment of unstable type II odontoid fractures in skeletally mature individuals. Spine (Phila Pa 1976) 2010;35:S209-18. Nourbakhsh A, Shi R, Vannemreddy P, Nanda A. Operative versus nonoperative management of acute odontoid type II fractures: A meta-analysis. J Neurosurg Spine 2009;11:651-8. Böhler J. Anterior stabilization for acute fractures and non-unions of the dens. J Bone Joint Surg Am 1982;64:18-27. Wagner SC, Schroeder GD, Kepler CK, Schupper AJ, Kandziora F, Vialle EN, et al. Controversies in the management of geriatric odontoid fractures. J Orthop Trauma 2017;31 Suppl 4:S44-8.